Basil J. Hiley is a British quantum physicist and professor emeritus of the University of London. He received the Majorana Prize "Best person in physics" in 2012. Long-time co-worker of David Bohm, Hiley is known for his work with Bohm on implicate orders and for his work on algebraic descriptions of quantum physics in terms of underlying symplectic and orthogonal Clifford algebras. Hiley co-authored the book The Undivided Universe with David Bohm, which is considered the main reference for Bohm's interpretation of quantum theory. The work of Bohm and Hiley has been characterized as primarily addressing the question "whether we can have an adequate conception of the reality of a quantum system, be this causal or be it stochastic or be it of any other nature" and meeting the scientific challenge of providing a mathematical description of quantum systems that matches the idea of an implicate order. Basil Hiley was born 1935 in Burma, where his father worked for the military for the British Raj. He moved to Hampshire, England, at the age of twelve, where he attended secondary school. His interest in science was stimulated by his teachers at secondary school and by books, in particular The Mysterious Universe by James Hopwood Jeans and Mr Tompkins in Wonderland by George Gamow. Hiley performed undergraduate studies at King's College London. He published a paper in 1961 on the random walk of a macromolecule, followed by further papers on the Ising model, and on lattice constant systems defined in graph theoretical terms. In 1962 he obtained his PhD from King's College in condensed matter physics, more specifically on cooperative phenomena in ferromagnets and long chain polymer models, under the supervision of Cyril Domb and Michael Fisher. Hiley first met David Bohm during a week-end meeting organized by the student society of King's College at Cumberland Lodge, where Bohm held a lecture. In 1961 Hiley was appointed assistant lecturer at Birkbeck College, where Bohm had taken the chair of Theoretical Physics shortly before. Hiley wanted to investigate how physics could be based on a notion of process, and he found that David Bohm held similar ideas. He reports that during the seminars he held together with Roger Penrose he was particularly fascinated by John Wheeler's "sum over three geometries" ideas that he was using to quantise gravity. 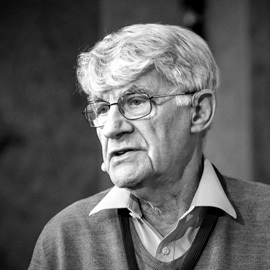 Hiley worked with David Bohm for many years on fundamental problems of theoretical physics. Initially Bohm's model of 1952 did not feature in their discussions; this changed when Hiley asked himself whether the "Einstein-Schrödinger equation", as Wheeler called it, might be found by studying the full implications of that model. They worked together closely for three decades. Together they wrote many publications, including the book The Undivided Universe: An Ontological Interpretation of Quantum Theory, published 1993, which is now considered the major reference for Bohm's interpretation of quantum theory. In 1995, Basil Hiley was appointed to the chair in physics at Birkbeck College at the University of London. He was awarded the 2012 Majorana Prize in the category The Best Person in Physics for the algebraic approach to quantum mechanics and furthermore in recognition of ″his paramount importance as natural philosopher, his critical and open minded attitude towards the role of science in contemporary culture".